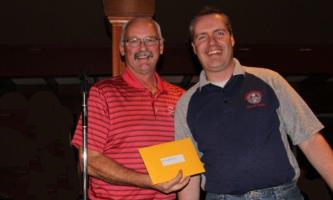 IAM District 250 Business Representative Al Cyr, on left, awards the grand prize to District 250 member Sam Lange at the district’s inaugural Guide Dogs of America charity golf tournament. Vancouver-area IAM District 250 held its first-ever Guide Dogs of America golf tournament, successfully raising more than $36,000 for the charity. IAM District 250 represents a varied cross section of skilled trade shops, including machining and fabrication, heavy equipment, commercial transport and automotive dealerships throughout British Columbia and the Northwest Territories. Guide Dogs of America provides guide dogs and instruction in their use, free of charge, to blind and visually impaired men and women from the U.S. and Canada so that they may continue to pursue their goals with increased mobility and independence.